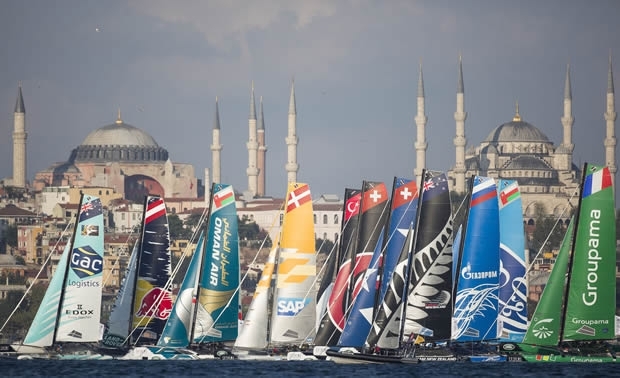 Day two at the Extreme Sailing Series Istanbul without doubt belonged to the two Oman Sail teams, with Oman Air clocking up more points then any other boat on the water to climb a massive four places on the leaderboard, and finish the day in third. Oman Air’s best day of the season couldn’t even be matched by their stablemate and defending champions The Wave, Muscat despite a brilliant showing by Leigh McMillan and the team, which has put a little light between them and Emirates Team New Zealand at the top of the leaderboard. In a day that could be described as the ‘day of the underdogs,’ GAC Pindar was also hugely impressive, earning the accolade as the quickest boat off the start line according to the SAP sailing analytics, which has shown the Aussie team as a real contender heading into tomorrow’s penultimate day in fourth place.